Audrey Hepburn was known for her gentle beatuy, elegance, and grace. Women admired her perpetually perfect posture that she maintained with simple diet. According to her first husband Mel Ferrer she ate plenty of protein and lots of vegetables and salads. For breakfast she reportedly had two boiled eggs, one piece of seven-grain whole-wheat toast and three or four cups of coffee laced with hot milk. Her friend Audrey Wilder said she was always eating spaghetti or a version of it which she combined with salad rather than protein. Her son mentioned she was a food combiner before that diet became fashionable. Furthermore, Audrey always maintained a healthy but disciplined diet, based upon her youthful training as a ballet dancer. Hepburn was not fond of formal exercise routines but she loved walking and would always find the time for it in her daily schedule. Not many people know she was absolutely devoted to ballet in her young years. She wanted to be a ballet dancer but was deemed too tall. Hepburn attributes her perfect posture to ballet lessons that she took as a young girl. Audrey Hepburn’s son, Sean Ferrer, worte nice and loving memoir about his mother. She was descriebed as genuinely good woman who valued family above career. In this brief passage, Sean discusses his mother’s perpetually perfect figure. My mother didn’t snack, but when she had a dessert, it had to be sweet. She loved a scoop of vanilla ice cream with maple syrup dribbled over it. After her afternoon nap, which she had learned to take because of the early calls and long hours of film production, she would often have a piece of chocolate—one piece! She said that chocolate chased away the blues. Here is another secret: my mother really wasn’t so thin. She used to refer to herself as “fake thin.” Her upper body, especially her thoracic cage, was thinner than average, thus her thin waist. The early whooping-cough incident, combined with malnutrition during the war, led to asthma in her youth, and she had somewhat weak lungs throughout her life. She smoked—like most dancers and just about everybody else at the time—and was told throughout her life that she might be in the early stages of emphysema. Her ballet training also played an important role in the development of her physique. Although her upper body was slight, her arms and her legs were athletic and she was well proportioned overall. So if you want to be in good shape, it’s pretty simple: Grow up during the war, suffer famine in your early life, exercise every day, and later in life eat reasonable amounts of everything and feel good about it. What this really means is that if we don’t feed too many fats or sugar to our children, they will have an easier time of it later in life. —Audrey Hepburn, An Elegant Spirit: A Son Remembers by Sean Hepburn Ferrer. 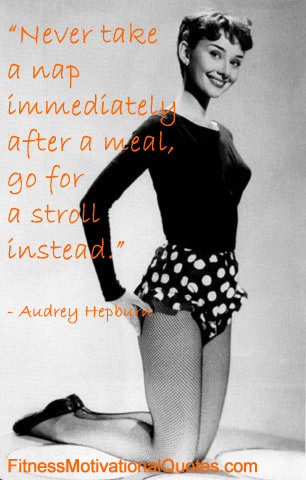 Audrey Hepburn other golden diet rules include not eating fried food and any kind of cheese. Last but not the least, never take a nap immediately after a meal, go for a stroll instead.